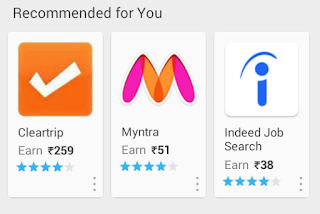 Nowdays, Mcent giving huge amount of free recharge by downloading apps. You can earn an unlimited amount of free recharges by downloading Apps Like Amazon, Flipkart, Myntra, Paytm and also via referal program where you need to refer your friend and get unlimited free recharge from Mcent App. Today in Thetechcounter, i will share working unlimited mcent hack trick to get 30 RS unlimited time from mcent just by doing below process.This mcent loot trick is successfully tested by me and its working 100%. 4. 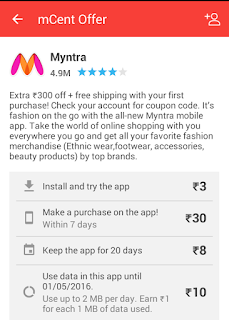 Download Myntra App and Open It For atleast 1 Min. Now Go Back to mcent app to get 3 Rs for install app. 5. 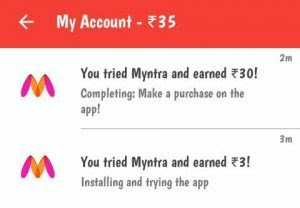 Now After Getting Rs.3 Come Back To Myntra App And Login Or Register At Myntra App. 8. You Can Earn Unlimited recharge By Making New Accounts At Mcent App and follow above 1 to 7 steps.